It might seem a pretty scary drill to attempt, but it will be worth it in the long run! 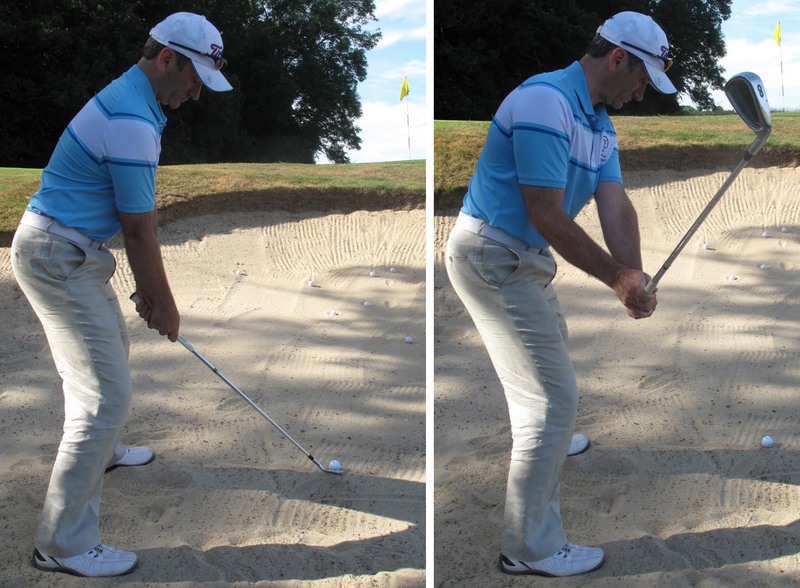 Grab an 8-iron and set up the clubface and ball as uncomfortably forward in your stance as you can on a flat bunker lie. What you're trying to do here is get the clubface as open as possible to give it the same loft as a sand wedge or lob wedge. The aim of the shot is to train yourself to adapt to any situation no matter what club or stance you have. It's a drill to give you the confidence to hit any tricky shot and it's great fun. So take out the 8-iron, lean back slightly and force the clubface open. And make sure you hinge those wrists, like before. This will generate the extra loft on the clubface. Despite the rather unusual set up, try and make sure the elbows remain close together. This triangle shape with your forearms and shoulders is vital for stability during the swing. With a few goes at this very challenging shot, you will understand the science behind hitting a high-flying sand shot and when it comes to using a sand wedge it will feel much more natural.